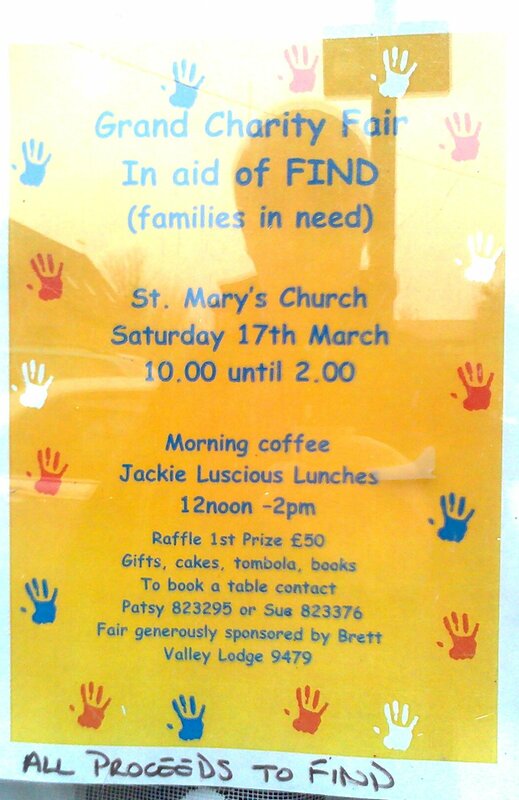 Tomorrow (Saturday) FIND (Families in Need) is holding a fund raiser at St. Mary’s Church Hadleigh from 10 until 2. With the current changes in the economy FIND is having to provide basic necessities like food to families in need. This is a local charity which deserves our support. If you’re free and in Hadleigh on Saturday, drop in to the church and see what’s happening. Short term (three hours) car parking in Hadleigh is free until noon on Saturdays. Thereafter parking is free for all of Saturday afternoon and evening. If you are visiting Hadleigh be careful of using the long term car parks which although they are also free for the first three hours will require a parking ticket up to 5 p.m. FIND is a Christian based charity that was founded in 1990 to provide emergency assistance to families or individuals affected by poverty or dispossession. FIND is also able to offer ongoing friendship and support to those in need. WHAT DOES FIND OFFER? The charity provides, free of charge: food; cooking utensils; clothing, toiletries; baby equipment & nappies; bedding; survival sleeping bags; curtains & furniture; white goods; Christmas hampers & gifts, etc. FIND also befriends people without judging them, offers advice when required and gives support for as long as it is needed. WHO DOES FIND HELP? Anyone living within 25 miles radius of Ipswich who is deprived of a minimum standard of living, be they single, families, lone parents, children, elderly, sick or disabled. Referrals may come from: Social Services; General and Psychiatric Hospitals; The Homeless Family Unit; Victim Support; Salvation Army; Asylum & Refugee Support Agencies; Women’s Aid; The Probation Service; YMCA & YWCA; Ipswich Community Resource Centre; Family Centres; Health Centres; other charities.